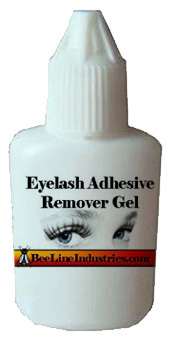 Our Gel Remover is a safe way to remove lash extensions from client’s eyes. Once applied, the Gel Remover breaks down the adhesive bonds, allowing lash extensions to slip off gently, causing no stress to the natural lash. The formula is easy to control and won't run into your clients' eyes when applied. Apply over the lash extensions generously and let sit for 90 seconds. Gently wipe lash extensions off with a micro swab. Rinse well after removal. Expertly packaged and high quality Medical Grade Adhesive Remover Instructions: When using this product, remove glue with tweezers. Touch product to eyelashes, pause and then gently pull with tweezers. Our Gel Remover is a safe way to remove lash extensions from client’s eyes. Once applied, the Gel Remover breaks down the adhesive bonds, allowing lash extensions to slip off gently, causing no stress to the natural lash. The formula is easy to control and won't run into your clients' eyes when applied. Expertly packaged and high quality Medical Grade Adhesive Remover Instructions: When using this product, remove glue with tweezers. Touch product to eyelashes, pause and then gently pull with tweezers.